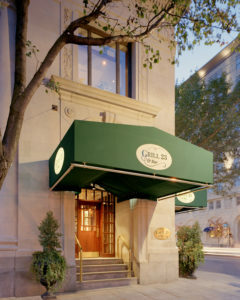 The perfect alfresco food and wine pairing, courtesy of the team at Grill 23 & Bar in Boston. When temperatures are rising and everything’s coming into bloom, it’s time to move mealtime outdoors. When you’re dining al fresco, there are a few guidelines worth noting: Keep the recipes simple — most of the work should be in the prep and not the execution — and have a favorite, versatile wine on hand at all times. We asked the team at Grill 23 & Bar in Boston’s Back Bay neighborhood for an ideal summer recipe and wine pairing. 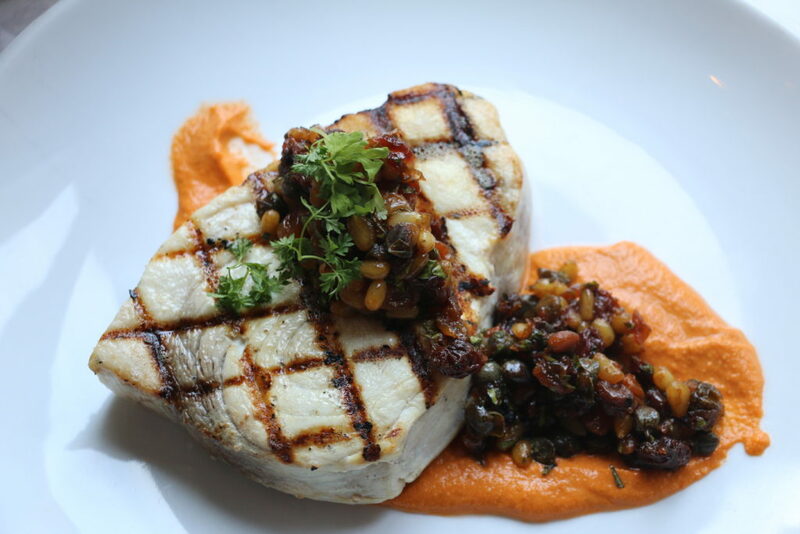 Executive Chef Brian Kevorkian and Master Sommelier Brahm Callahan, who also is a Ribera y Rueda ambassador, returned with this fresh take on grilled swordfish, letting the savory flavors come through in a piquant caper relish alongside a bright Romesco sauce. Both the dish and the wine are currently available at the restaurant, but if you can’t get to Boston soon, they were kind enough to share the recipe below. Get the grill and wine glasses ready. This beauty in this recipe lies in the preparation—a quick marinade for the swordfish gives you plenty of time to prep the sauces before grilling the fish and serving it. Your local fishmonger can cut the swordfish steaks for you. Heat your grill to medium-high. While it warms, prepare the marinade. Combine extra virgin olive oil, oregano, parsley and lemon zest in a bowl and whisk together. Place swordfish steaks in a shallow baking dish and pour over marinade; marinate for no more than 45 minutes. While swordfish marinates, prepare pine nut relish. Combine raisins, honey, sherry vinegar, onion, and water in a small sauté pan, and cook over medium heat until liquid is almost all gone, about 5 minutes. Let cool, then mix with capers, pine nuts, garlic, lemon zest and juice, parsley, salt, pepper, and olive oil. If mixture is too dense, add olive oil until you reach desired consistency. Prepare Romesco sauce. Combine sliced garlic with 1 tablespoon olive oil in a pan, and “sweat” over medium low heat until light brown. Place garlic in a blender or food processor, and add pimento pepper, toasted almonds, tomato, parsley, olive oil, lemon juice, red wine vinegar, salt and pepper, and blend until smooth. If mixture is too thick, add more olive oil until mixture resembles a fine purée. Grill swordfish on medium-high heat for about four minutes a side. Thicker steaks may need a little more time. When ready, transfer to plates and serve with pine nut relish and Romesco. Some white with your Sour Patch Kids? Tips on unusual wine and food pairings pop up on Forbes, The Daily Meal, AskMen and more.